Neoliberal epistemontology presumes, first, that everything that can be known is known best on the model of market-logic. But, as James (and Foucault) note, the coherency of that epistemological presumption depends upon, includes and often veils another, almost indistinguishable, ontological presumption: namely, that everything that is is a market. Of course, such "epistemontologies" end up being massive feedback loops, philosophically speaking; they produce and reproduce the very phenomena that they claim to be simply discovering and analyzing. (Fwiw, I think there are some strains of psychoanalytic theory that suffer the same fate.) 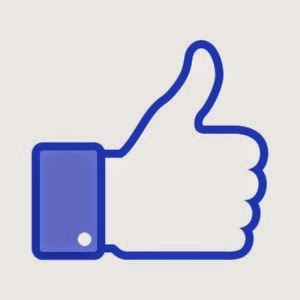 The fact that neoliberalism, as an ideology, is first and foremost an epistemontology of this sort provides James a way of explaining why most of the historical manifestations of it (she includes "big data, post-identity politics, globalization, creative destruction, resilience, sustainability, privatization, biopolitics, relational aesthetics") are consistently understood through algorithms. Neoliberals, believing that all that is is a market, are ever in search of better predictive mathematical formulas for understanding how the agents of that market will freely and rationally determine their interests and direct the market... and/yet/but, by virtue of those same algorithmic analyses, neoliberals also end up manipulating the market, its agents, and whatever remains of what we take to be the "freedom" involved in "free choice." One of the most interesting parts of James' essay, to my mind, is her (excellent, but all too brief!) explanation of the prominence neoliberal ideology affords to algorithms. Neoliberal economic analyses, to quote James, "find the signal in the noise" of phenomena and human behavior by combining two sets of ideological commitments: (1) a commitment to particular epsitemontological presumptions (the world/reality is a market, agents in the world are intentionally rational, agents' behaviors are systematic/non-random/predictable and, thus, can be known/understood) and (2) a commitment to algorithmic analysis, constant mathematical modeling, which is itself necessitated by the presumptions of (1). James teases out the implications with a musical metaphor: one way to understand harmony is as a consequence of "phase convergence" (when wave forms with different frequencies fall into sync); if we understand individuals as distinct wave forms with different frequencies, as neoliberalism does, then we can allow for the possibility of "social harmony" without needing to collapse the distinct wave forms into one another or erase their difference in frequency. Metaphorically, neoliberalism can understand social harmony as something that "naturally" occurs in phases-- asynchronous things will, over time, fall in and out of sync with each other-- without sacrificing neoliberalism's commitment to the idiosyncratic, free, rational intentionality of individual agents. Thus, "achieving" social harmony, if that is a legitimate project at all, ought not be a project of regulating individuals so that they operate more in sync with one another, but rather staying out of their way. (Don't tread on me!) Of course, the great irony evident in neoliberals' ubiquitous efforts at data-collection-- their constant, relentless and mostly covert encroachment into our "private" lives-- is that such efforts are justified on the basis of safeguarding our individual freedom to engage in the market according to our own interests, as those interests are freely determined by us. To the extent that there's anything really missing in James' argument-- and, to be fair, hers is a very short piece that does not pretend to offer a full analysis-- I think it's an under-emphasis on another presumption of neoliberal epistemontology: the market (which we ought remember, for neoliberals, is all that is the case) is ever guided by an Invisible Hand. James' focus on algorithms and mathematical modeling is immensely valuable for understanding many of the epistemological commitments and strategies of neoliberal epistemontology, but I'd just like to unpack the implications of the ontological (or, really, onto-theological) commitments of the neoliberal "reality-as-market" worldview briefly here. Perhaps the single most important proposition in modern capitalist economic theory, inherited from Adam Smith, is that competitive markets do a good job of allocating resources, that such markets channel individuals' self-interest toward the collective good as if directed by an "invisible hand." (I won't detail the manner in which such a proposition qualifies as "onto-theological" here, partly because there simply isn't room to do so, but mostly because I think it is self-evident.) There is, of course, a long and varied history of philosophical and/or religious commitments to the world-as-purposive or the world-as-Good or the world-as-intelligently-designed. Despite their differences in detail, and despite their sometimes outright antagonisms, what they share in common is a certain, fundamentally ontological, inflection that posits all that is the case as aiming-to-be or destined-to-be orderly, rational, if not also just and morally good. One of the problems with neoliberalism's particular ("invisible hand") iteration of onto-theological prejudice-- and this is something that James' account of the neoliberal "algorithmic modelling" fetish made more clear to me-- is that it effectively blinds itself to the manner in which it not only does, but must, conflate the Hand-that-Guides with the hand(s)-that-are-guided. When synchronicity or harmony is absent, when dissonance is resonant, when the aleatory interrupts or real human freedom (s'il y en a) insists-- that is to say, when the Invisible Hand is not only non-apparent but also non-existent-- neoliberalism's epistemonto(theo)logical commitments force neoliberals to, quite literally, phish or cut bait. And what is phishing, after all, but the manufacturing of an Invisible Hand? What are drones, for that matter? So, perhaps (but not really) pace James, I'm not convinced that neoliberalism is as passive with regard to "social harmony" as her analysis might suggest. (For the record, I don't think she meant to suggest that neoliberalism is passive and I'm confident that she doesn't think that.) Neoliberals aren't simply playing around with predictive algorithms and waiting for a harmonic or synchronous phase convergence--that is NOT James' thesis, for the record-- but rather, I suspect, neoliberals' epistemontological commitments put them squarely in the seat of the remote-operator of a drone we might call "Invisible Hand." And, not to put too fine a point on it, but the "Invisible Hand" drone is a deadly effective weapon that basically works like this: defund or deregulate, make sure things don't work, wait for people to get angry, then privatize. That's the formula Noam Chomsky detailed in his brilliant essay "The State-Corporate Complex: A Threat To Freedom and Survival", in which he also sagely reminded us that the only occurrence of the phrase "invisible hand" in Adam Smith's Wealth of Nations appears in a passage that critiques what we now call neoliberalism. To wit, all this has inclined me to think that the customary use of the Gadsden flag ("Don't tread on me!") to represent neoliberalism is perhaps not as appropriate as opting instead for the Franklin woodcut ("Join, or Die") that I used at the top of this post. 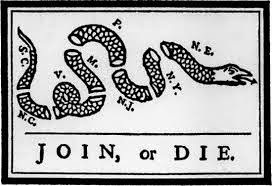 "Join, or Die" seems to be far more indicative of the neoliberal imperative, shouted into the panopticon of our modern world and echoed off every wall by banks, political parties, corporations, families, nation-states, social groups and social media. I think it's consistent with James' Foucaultian-inspired insights to say that the post-9/11 neoliberal project determines even more than what Foucault conjectured contemporary notions of nation-state "sovereignty" determine. The sovereign nation-state determined "[who] to make live and [who] to let die," but neoliberal entities-- hardly ever nation-states anymore-- determine who to make live and who to make die. Because "living" is utterly unrecognizable except as an algorithmic variable by big neoliberal data, there is no "living" that is not "joining." And there is no not-joining without dying.